A specific focus and intent of this final volume of A People's History of Christianity is to delve behind the global phenomenon of Christianity to glimpse some of the very rich and dynamic lifeways within it. Ranging over the whole century and across several continents, the scholars in this volume probe Christians' creative encounters with popular culture, liturgy and spirituality, social change and Marxism, intrareligious and interreligious dialogue, and changes in gender expectations and roles. Includes 50 illustrations, maps, bibliographies, and an 8-page color gallery. Contributors include Mary Farrell Bednarowski; Mercy Oduyoye, Ghana; Patrick Henry, St. John's University; Bruce Forbes, Morningside College; Valerie Demarinis, Upsaala University; Rosetta E. Ross, Spelman College; Ada Mariacute;a Isasi-Diacute;az, Drew University; Mark Noll, Wheaton College; Ann Pederson, Augustana College; Eleazar Fernaacute;ndez, United Theological Seminary of the Twin Cities; Victoria Barnett United States Holocaust Memorial Museum; Margaret Bendroth, American Congregational Association; Oscar Cole-Arnal, Waterloo Lutheran Seminary; Paul Mojzes, Rosemont College; Luis Rivera-Pagaacute;n, Princeton Theological Seminary; Ethan Sanders, University of Cambridge; Christina Traina, Northwestern University; Jean-Paul Wiest, University of San Francisco. 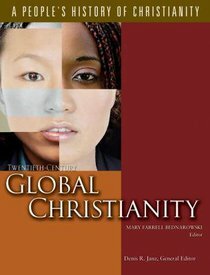 About "Twentieth-Century Global Christianiy (#07 in A People's History Of Christianity Series)"
Bednarowski is Professor of Religious Studies at United Theological Seminary of the Twin Cities.